Admittedly, I was somewhat hesitant to view another one of patently pretentious French director Philippe Garrel’s works, especially in a sober state, as his perhaps most internationally famous work, Le Cicatrice Interieure (1972), starring his beloved muse Nico in the lead role, left me with somewhat ambivalent feelings in which I found myself all at once thoroughly entranced by its surrealist scenarios against pallid, yet powerful panoramas but on the other hand gratingly annoyed by Nico’s decidedly childish, whiny behavior and the all around excruciatingly difficult to follow plot (or lack thereof). But being the ever-faithful film viewer that I am, and seeing that I am also a dedicated fan of the flaxen-haired chanteuse Nico, even if she is an occasionally annoying actress, I decided to give Garrel another chance with Le berceau de cristal aka The Crystal Cradle (1975), and I am quite thankful I did—my only regrets being that I could not have turned out all of the lights in my humble home and found myself viewing it while plonked down on the couch surrounded in total darkness and inebriated by some blissfully mind-altering substance. Indeed, at just over an hour long, Le berceau de cristal is another aimlessly meandering and surreal yet minimalist work with the entirety of its focus on the decidedly divine Nico, Garrel’s much loved opiate-abusing muse, which in much the same vein as its sister film Le Cicatrice Interieure turns a somewhat uncomfortable, angst-ridden eye to unraveling the corrupted contents of Nico’s soul—with krautrock hippie composers Ash Ra Tempel providing the mellow musical score—that will either pleasantly tap into one’s overly emotional, romantic inner goth or send the scintillating synapses of the drug-addled dope fiend all the more abuzz (or, for the more conventional film viewer, will render him absolutely mad and desiring only to gouge his eyes out). Le berceau de cristal is indeed a very dark, minimalist work, the main focus of which is Nico’s lovely, sculpted visage, to which the viewer is introduced with her inside a dark tomb, intermittently taking a puff of a cigarette, reading pages from a book, and applying powder to her face. Almost immediately, the smooth, ethereal music of Ash Ra Tempel aurally wisps about, as if it is invisibly accentuating something unseen in the empty, yet tenebrous atmosphere. In typical fashion, Garrel spends a lot of time (as ever, too much time, especially for the less attentive viewer) focusing on Nico’s face for minutes at a time, which is perhaps testament to his languishing pretentiousness as a stereotypical Frenchman (or perhaps he was truly in love with the statuesque beauty and wanted to forever immortalize her angelic countenance, even if to a rather pedantic extent). 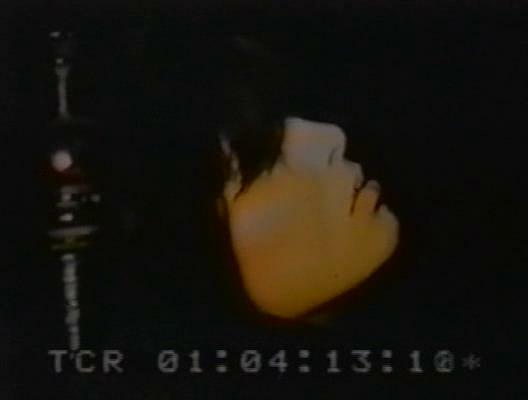 The meandering music suddenly turns more ominous, at which point the audience bears witness to a marvelous montage of surreal images, seemingly symbols born out of Nico’s imagination: first, a crescent moon against a black sky, then four cloaked female figures, sitting side-by-side in darkness, juxtaposed against the next scene of a virginal, yet maniacal nymph muttering something inaudible to herself in a sunlit forest (played by much beloved French actress Dominique Sanda). At about 20 minutes into the film, Garrel again turns to Nico’s face, and she begins reading some decidedly angsty, goth-ridden nonsensical poetry (the sort of vapid stuff I’d ashamedly written during my agonizingly embarrassing adolescent years), with lines like, “I have come to lie with you. I have come to die with you. On your pallid shoulder and your golden chest, in a wilderness of glass we rest.” After Nico reads a couple more lines, Anita Pallenberg, the Italian-German model and muse of the Rolling Stones appears on the screen, and starts snorting a substance off of her hand (presumably cocaine) and smiles impishly into the camera, yet never uttering a single word. Nico, in her characteristically throaty and masculine German accent, continues to read her rather puerile poetry until, at the very end of the film, while seated in a chair still within the confines of the dark tomb, she brings a small gun to her temple and proceeds to blow her brains out (pretending of course), at which point she sprawls herself across the chair in the most dramatic fashion possible, presumed a victim to her overactive, drug-addled imagination, somber soliloquies and pedantic prose. While Le berceau de cristal is at times rather monotonous and slow and definitely nonsensical, there is a certain mysterious charm to the film that will undoubtedly enthrall and perhaps even excite the more morbidly inclined and introverted of individuals, or those who frequently partake in chemically altered states and can find themselves patiently entranced by sometimes minutes-long shots focused solely on Nico’s face (especially with its achingly haunting krautrock soundtrack, also titled Le berceau de cristal by Ash Ra Tempel who presumably collaborated with Garrel in some fashion, or to whom Garrel made the work as a sort of homage, as the album’s cover art featuring a naked nymph seated on a rock is also seen in the film). Compared against Garrel’s more acclaimed and ambitious work Le Cicatrice Interieure, Le berceau de cristal is aesthetically underwhelming but equally nonsensical and just as thick on symbolism yet much less grating in terms of its lack of plot and virtual absence of any sort of dialogue, particularly of the puerile and/or pedantic sort. 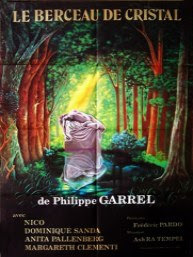 Featuring appearances by his much loved, drug-addled muses (namely Nico, and Anita Pallenberg, who both battled hellish heroin addictions themselves, with Nico later tragically dying while in recovery), and heavy on ethereal, dreamy imagery, juxtaposed against an overall minimal aura, Le berceau de cristal is testament to Garrel’s lustful love for his leading ladies, and essential viewing for art fag film lovers everywhere, either of the inherently mentally moribund persuasion, or for those who can artificially render themselves stupefied and drooling in front of a tv screen (in a good way, of course).